Please Note: The 2X-YHWR172-2SW is made up of two separate units placed side by side. Each unit has it's own power cord. 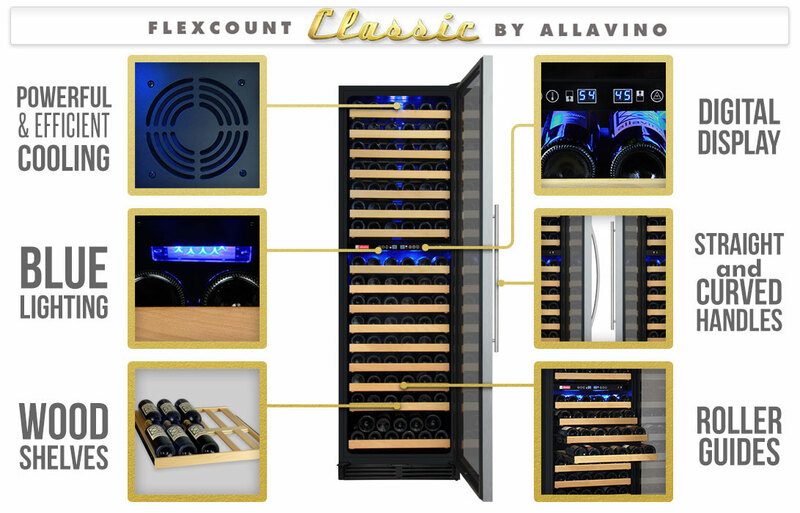 The Allavino Flex Count Series 2X-YHWR172-2SW Multi Zone Wine Refrigerator is an excellent choice for any wine enthusiast who enjoys both red and white wine equally. 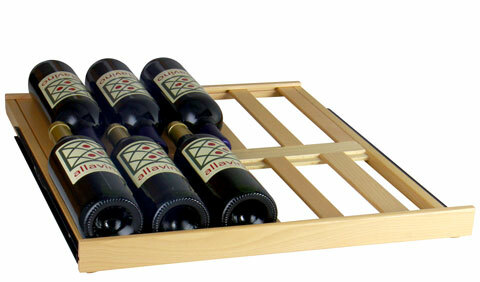 Consisting of two dual zone units, it provides four distinct temperature zones with which to store your wine. With plenty of features like push-button controls, UV protected dual pane glass, digital temperature display, cool blue display lighting, wood wine racks on full-extension rollers, and a security lock for peace of mind, this wine refrigerator has everything you could possibly need. Another attribute of this unit is a sophisticated look consisting of finished black cabinets with brushed stainless steel door frames. Four separate cooling zones give you the ability to store multiple varietals of wine at different temperatures. Internal fans direct cool air where you need it, allowing you to set the lower zones between 54-65° F and set the upper zones between 40-56° F. State-of-the-art compressors provide powerful cooling while being efficient enough to meet the strict California Department of Energy consumption guidelines. 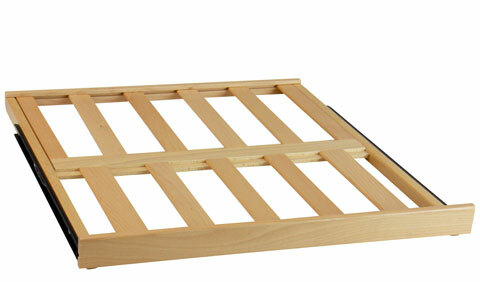 28 sturdy wooden shelves gently cradle your bottles and reduce harmful vibration that could upset the sediment of your wine during long term storage. Telescoping roller assemblies extend all but the bottom shelf so that you can easily view and access the rear bottles, so you don't have to remove the front bottles to determine what is behind them. The classic design elements incorporated into this stunning wine cellar will be sure to impress your friends in any environment. It's sides and top have a sleek black finish so it can be used freestanding in the dining room but it's front venting construction allows it to be built into cabinetry for a seamless look in the kitchen. Cool blue display lighting, elegant wood wine racks and a brushed stainless steel door frame complete the wine cooler's appealing look. Black Cabinet and Two Stainless Steel Framed Glass Doors with French style opening. Bottle A is the ideal bottle size. The bottles are just short enough that the neck of the back bottles fit between the shoulders of the front bottles without touching and the 2-15/16" diameter allows plenty of room between bottles. This allows you to fit 20 bottles on the top rack of each zone and 11 bottles on the other 24 racks with a total capacity of 344 bottles. Bottle B is the least ideal for spacing because it is taller than the average bottle at both the top and the shoulder. If only using this size bottle, the top of the rear bottles on the rack would hit the shoulder of the front bottles on the rack and push them too far to either side to have bottles all the way across the front of the rack. We were able to fit 11 bottles in one row across the top shelf in each zone and on the very bottom shelf by putting 6 bottles across in the grooves with 5 bottles stacked on top of them. On each of the remaining 22 shelves, we were able to fit 8 bottles per shelf by placing one bottle in front (neck facing back) and another bottle in the back (neck facing front), skipping a groove before adding another set of bottles in the same manner three more times, creating two rows of four bottles per row. 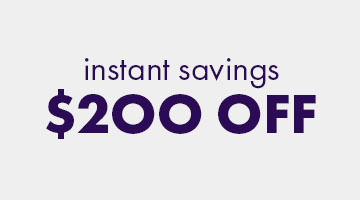 This reduces the overall capacity to 242 bottles if your entire collection is this size; however, you could mix smaller sized bottles in with this size for instance by placing a row of size B and a row of size A, still achieving the maximum capacity of 344 bottles. Bottle C is 2 3/4" wide at the base, but 3 1/4" wide at the shoulder. The shelves' grooves are spaced in such a way that this size bottle's shoulder will touch the bottle next to it, but the height still allows you to fit the normal amount of bottles on a shelf for the full 344 bottle capacity. 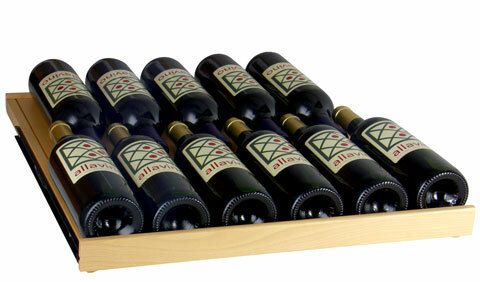 Bottle D is shorter and wider, and the bigger diameter will not allow you to stack bottles on the bottom shelf. 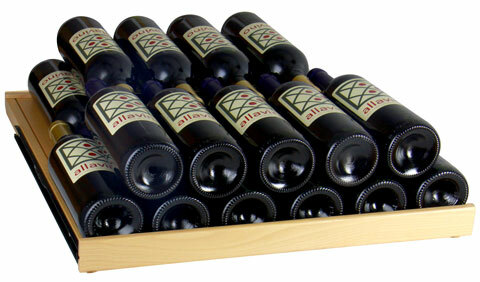 This reduces the overall capacity by 10, for a maximum capacity of 334 bottles if your entire collection were this size. Bottle E is even wider, with a diameter of 3-1/2". They still fit on most of the shelves without having to remove a rack, but they require that a groove be skipped between the bottles which reduced the bottles per shelf to 8 on the upper shelves and 5 on each bottom shelf. That would reduce the overall capacity to 218 bottles if your entire collection were this size.